China has pledged two billion yuan ($327 million) in aid to Afghanistan, which is seeking new sources of foreign help amid a drawdown of U.S. troops and increasing worries about regional instability. 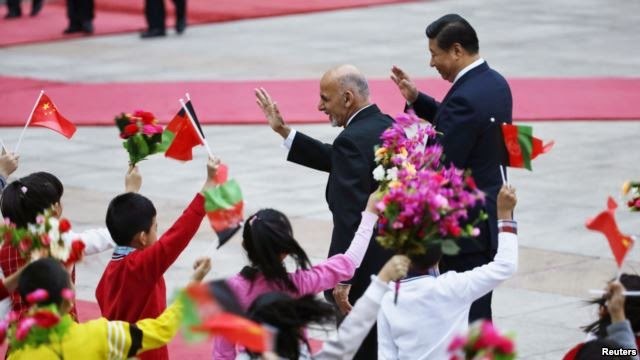 The offer of aid through 2017 came after China’s President Xi Jinping and newly elected Afghan President Ashraf Ghani met in Beijing on Tuesday, according to a joint declaration published Wednesday by China’s foreign ministry. Beijing and Kabul also agreed to step up intelligence sharing to fight drug trafficking and address other cross-border issues. 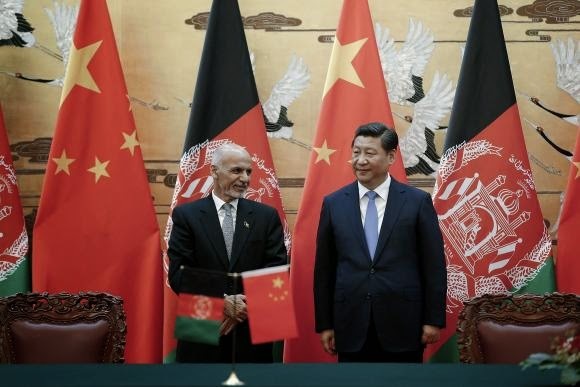 Afghanistan's President Ashraf Ghani has pledged to help China fight Islamist extremists, a senior Chinese official said on Tuesday, after Ghani met President Xi Jinping in Beijing on his first visit abroad since his September inauguration. China, which is connected to Afghanistan by the narrow, almost impassable Wakhan Corridor, says militants seeking to set up a separate state called East Turkistan in its western Xinjiang region are holed up along the ungoverned Afghan-Pakistani border. "In the area of security, President Ghani expressed the readiness and staunch support from the Afghan side in China's fight against East Turkistan Islamic Movement terrorist forces," Kong Xuanyou, Director General of the Foreign Ministry's Asian Affairs Department, told journalists after Ghani and Xi met. Could Iran and China Cut the US Out of Afghanistan? Chinese State Councilor Yang Jiechi and Iranian Foreign Minister Mohammad Javad Zarif met in Beijing on Friday, Xinhua reports. On one level, the meeting was simply the latest example of growing China-Iran ties. The timing of the meeting, however, suggests a more specific aim for bilateral relations – greater cooperation between Beijing and Tehran to achieve their joint goals in Afghanistan. While China has been relatively accepting of U.S. involvement in Afghanistan as a means of achieving this end goal, Iran wants the U.S. gone as soon as possible. Unlike other major regional powers, Tehran opposed the recently-signed Bilateral Security Agreement that will allow a limited number of U.S. troops to remain in Afghanistan post-2014. Currently, Beijing is willing to accept the U.S. troop presence in Afghanistan as a necessary evil. However, if Iran and China can cooperate to achieve their goals vis-à-vis Afghanistan while reducing or eliminating the need for U.S. involvement, it would suit both countries’ goals. Asked by India Today if China was prepared to take steps to address Afghan and Indian concerns on terrorism emanating from Pakistan, Chinese Foreign Minister Wang Yi said, "I am happy to tell you that among the confidence building measures we agreed today, the first is on counterterrorism". "We believe that the international community should not accept any forms of terrorism," he said. "During the conference we have had an extensive exchange of views on the topic." An Indian official present at Friday's meet said that it was striking that the terror issue took centre stage. "At one point this was as sensitive for China as [raising] the South China Sea" considering Beijing's "all-weather" ties with Pakistan, the official said. 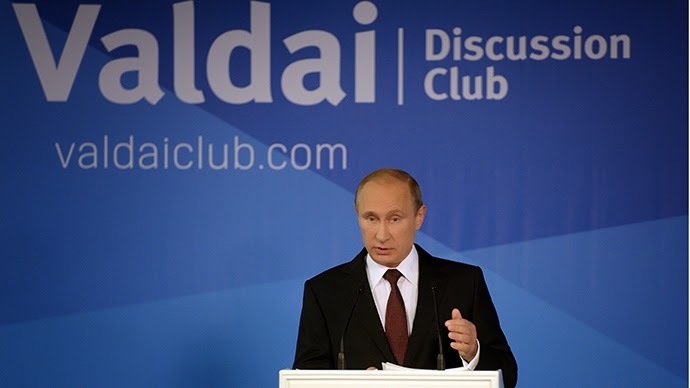 Russian President Vladimir Putin accused the United States of sponsoring terrorism in Russia and Central Asia. Like so many of the world’s most brutal dictators, military leaders, tyrants, and jihadists, it appears Tarkhan was trained by the very best: the United States government. According to his father and former colleagues, Tarkhan worked for an elite “Spetsnaz” Georgian military-intelligence unit—at least until he caught tuberculosis, lost his job in the intelligence unit, was then framed by that same intelligence unit, and went to jail in 2010 for weapons possession. The Turkish man who is suspected of killing a Chechen leader in Turkey last year has been detained and confessed to the murder, claiming that “pro-Russian Chechens” had made him shoot the victim. The Chechen Republic of Ichkeria’s honorary consul in Ankara, Medet Ünlü, 53, was killed by armed assailants at the honorary consulate in Ankara on May 22, 2013. “They promised me a life in Ukraine that I can’t even imagine,” he reportedly told police, referring to pro-Russian Chechens in Turkey who commissioned him to target Ünlü, because Ünlü was sending Turkish donations to opposition members in Chechnya. The Prime Minister of Georgia Irakli Garibashvili offered autonomy and the European perspective to the Abkhaz and Ossetian peoples. 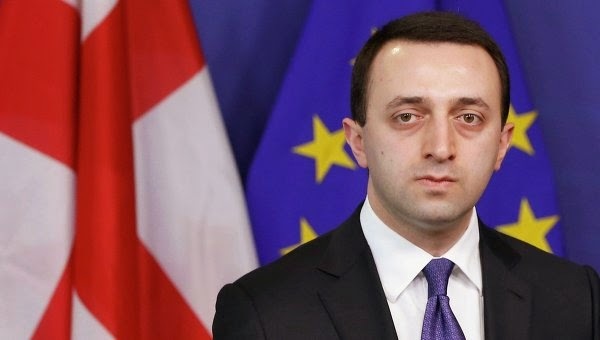 “I am sure that only with us, with Georgia, which has the European perspectives, our Abkhazian brothers will be able to preserve their language and culture,” Garibashvili said. South Ossetia to Russia: Go Ahead, Crimea Me! While Russia is on a land-grabbing binge, South Ossetia hopes Moscow will not forget about its aspirations, too. The region’s separatist leadership is drawing up an agreement meant to insert the disputed territory into the Russian Federation. The agreement is influenced by a recent integration plan that Moscow offered to South Ossetia’s separatist twin, Abkhazia, but reportedly goes far beyond it. Both regions maintain de-facto independence from Georgia and almost existentially rely on backing from Russia. Abkhazia, however, insists on some ground rules in its relationship with Moscow, such as keeping space for sovereignty. Georgian Defense Minister, Irakli Alasania, met his German counterpart Ursula von der Leyen in Berlin on October 30. Bilateral cooperation, Georgia’s contribution to the Afghan mission, as well as situation in the Caucasus region and relations with Russia were discussed during the meeting, according to the German Ministry of Defense. “Georgian-German military cooperation is being intensified,” Alasania said, adding that Georgia’s contribution to the Afghan mission, as well as Germany’s assistance in the field of military education and implementation of the NATO-Georgia cooperation package offered by the Alliance at the Wales summit.